American White Oak is another of our best-sellers. While similar in appearance to European Oak it can vary more in colour but is often indistinguishable when planed and treated. 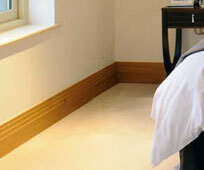 American White Oak is very durable and used frequently in heavy construction. From southern Quebec and Ontario to eastern Minnesota and Iowa, extending eastward to the Atlantic and southward through the lower western slopes of the Allegheny and Appalachian Mountains. The white oaks vary in size and form according to species and soil conditions, some are unsuitable for timber production, but others vary in height from 15m to 30m, well-grown specimens having a clear cylindrical bole of up to 15m with a diameter of about 1.0m. 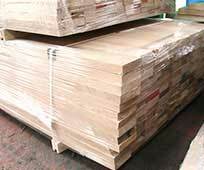 Although generally resembling European oak, American white oak is more variable in colour, ranging from pale yellow-brown to pale-reddish brown, often with a pinkish tiny. The multiseriate rays are generally higher than those of the red oaks on quarter-sawn surfaces. The grain is generally straight, and the texture varies from coarse to medium coarse. As with the red oaks, the quality depends greatly on the conditions of growth ; slowly-grown northern white oaks usually being lighter in weight and milder, than that from the southern states. The Appalachian Mountains used to provide beautiful mild white oak greatly esteemed for furniture and cabinet-making, but much of this forest area has been destroyed in recent years due to open-cast coal mining activities. Southern white oak is typically fast grown, and with its wide growth-rings is relatively coarse and more suited to constructional use. 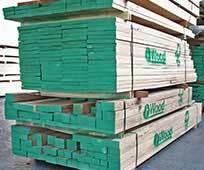 White oak weighs about 770 kg/m3 when dried. Like all the true oaks the timber dries slowly, with a tendency to split, check and honeycomb. 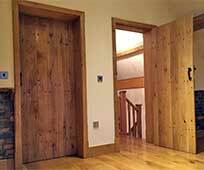 It compares fairly closely with European oak in general strength but on the whole, its higher density provides rather higher strength. Variable in working properties according to rate of growth, slow-grown material being easier to work than fast-grown, but either can be finished smoothly if care is taken. A reduction of cutting angle to 20 degrees is often helpful in planning. 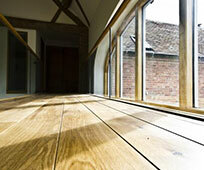 The timber can be glued, stained and polished, and takes nails and screws well. Heavy construction, flooring, furniture, pews and pulpits, doors, counters, boats, ladder rungs, agricultural implements, wagon bottoms, coffins, veneer and cooperage white oak barrels being the only satisfactory containers for beer, wine and alcoholic spirits.